In March, U.S. sales of the Ram pickup fell 11 percent, and volume is down 13 percent through the first three months of the year. DETROIT -- FCA US, battling a decline in demand for Ram pickups, is offering added incentives to U.S. dealers who add new trucks to their service loaner fleets and count them as sales. FCA told dealers in an April 16 email that, for April, the automaker would count any Ram pickup or commercial van placed into its Courtesy Transportation Program as a sale that will help dealers achieve monthly goals. Under FCA's stair-step incentive program, known by the acronym VGP, dealers earn bonus payments from the factory for each vehicle sold in a given month, but only if they reach factory-set sales targets for their dealerships. While subsidizing quick turns of dealer loaner fleets to juice monthly sales is not a new practice at either FCA or other automakers, doing so with highly profitable and popular pickups is unusual. It may show the pressure FCA is under to have a successful launch of the redesigned 2019 Ram 1500 pickup, a key to meeting the company's aggressive financial targets in 2018 as CEO Sergio Marchionne prepares to retire at the end of the year. In the email to dealers obtained by Automotive News, FCA US said that while the Ram vehicles placed into loaner fleets would count in April toward meeting sales goals, the automaker would not pay per-vehicle VGP bonuses on them. 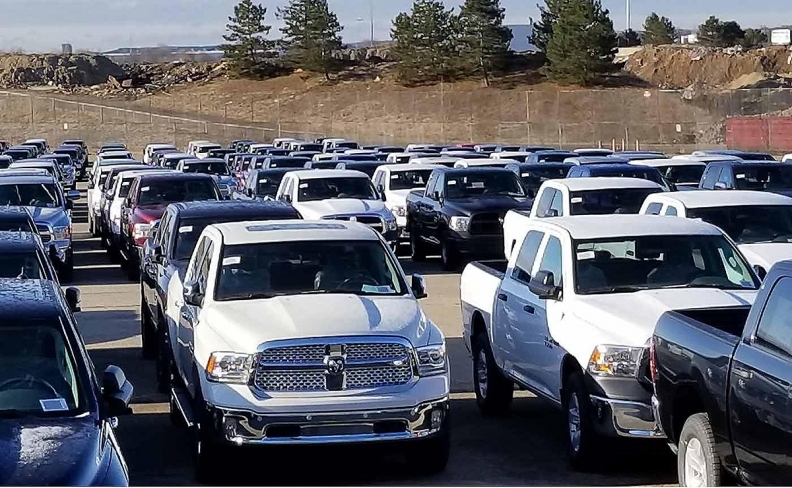 For example, a dealership with a goal of selling 25 Ram pickups in April to qualify for $800 per vehicle in stair-step incentives could choose to place 10 unsold pickups into its service loaner fleet. If the dealership then sold at least 15 Rams to retail customers, it would receive a $12,000 bonus from FCA. Although that's less than the $20,000 bonus the dealership would get for selling all 25 pickups at retail, the store would get no bonus if it fell short of the 25-vehicle target. All of the pickups, including those placed into service as loaner vehicles, can be reported as sold by FCA when the automaker releases its April U.S. sales results on May 1. The dealer may, after a short time, choose to sell the 10 Ram pickups placed into the Courtesy Transportation Program as used vehicles, for which the dealership would receive a separate stipend from FCA US. Two dealers who spoke to Automotive News said FCA has offered similar programs in the past, with one exception: They couldn't recall the automaker ever using its Courtesy Transportation Program to boost its best-selling nameplate, the Ram pickup. Other Ram brand products, including the heavy-duty pickup as well as the full-size ProMaster and small ProMaster City vans, also qualify for the Courtesy Transportation Program spiff, according to the email. A spokesman for FCA declined to comment. The email shared with Automotive News was sent to dealers by one of FCA's nine regional U.S. business centers. Dealers in two other regions confirmed that they, too, had received emails about the program, but it was unclear whether all U.S. dealers received the same email. Fiat Chrysler Automobiles is scheduled to report first-quarter earnings Thursday. A key part of the automaker's strategy to hit aggressive 2018 financial targets relies on boosting sales of Ram pickups and Jeep SUVs, made possible, in part, because FCA simultaneously is producing the previous-generation Ram 1500 as well as the redesigned 2019 version. Sales of the rival Ford F series increased 7 percent last month and are up 4.3 percent through March. Chevy Silverado sales rose 24 percent in March and are up 5.5 percent for the year. The 2019 Ram 1500 began arriving on dealer lots last month -- but only those equipped with the 5.7-liter Hemi V-8 engine, which carries the same 15 mpg city/22 mpg highway/17 mpg combined fuel economy rating as the previous-generation vehicle, according to the EPA's fueleconomy.gov website. The EPA has not yet set the ratings for the base 3.6-liter V-6 engine, which comes standard with a 48-volt belt-start generator to improve fuel economy, meaning dealers cannot yet sell those vehicles. In addition to counting Rams placed in the service loaner fleet toward a dealership's stair-step goal, FCA juiced its internal and external incentives to drive Ram brand sales. According to dealer communications this month shared with Automotive News, FCA said it would double the in-service payments it makes to dealers who place any 2017 Ram brand vehicle in the Courtesy Transportation Program. The automaker also added $1,500 in bonus cash for remaining 2017 Ram 1500s, plus an additional $500 bonus cash for 2017 Ram 1500s with the 3.0-liter EcoDiesel engine. The automaker also added $500 in bonus cash toward the purchase or lease of any 2018 Ram 1500 pickup. All of the incentives are valid through the end of the month. FCA has stockpiled vehicles -- including a large number of the redesigned and outgoing Ram pickups as well as redesigned Jeep Wrangler SUVs -- in several temporary lots in Michigan and Ohio. Those include the site of the former Pontiac Silverdome football stadium north of Detroit as well as a 2-mile-long former Dana Corp. test track in Ottawa Lake, Mich., just north of Toledo, Ohio. A spokesman declined to say why the vehicles were being stored there.